Greetings from The 88 Project! We are bringing you news, analysis, and actions regarding human rights and civil society in Vietnam during the week of September 24-30. From September 22-27, four activists from Can Tho province were tried for their activities on Facebook and sentenced to prison terms in a climate of increased censorship of online activities in Vietnam after several massive national protests in June. All were tried under the charges of “abusing democratic freedoms” for posting social and political commentary online. The four are: Nguyen Hong Nguyen, Truong Dinh Khang, Doan Khanh Vinh Quang, and Bui Manh Dong. Nguyen was sentenced to two years, Khang to one, Quang to 27 months, and Dong to 30 months. All of this comes just days before the long-awaited trial of activist Luu Van Vinh and four co-defendants on October 5. The five have been in pre-trial detention for almost two years. In addition, the state has finally confirmed the arrests of nine members of a constitutional rights group; they were arrested in early September and will now await trial in detention. In prison, Mother Mushroom has still not fully recovered from her July 2018 hunger strike, and labor rights activist Tran Thi Nga was denied a visit from her family. Political prisoner Nguyen Nam Phong says he was beaten multiple times in detention and is in poor health from prison labor. This week, security officers surrounded activist Dung Truong in his home. 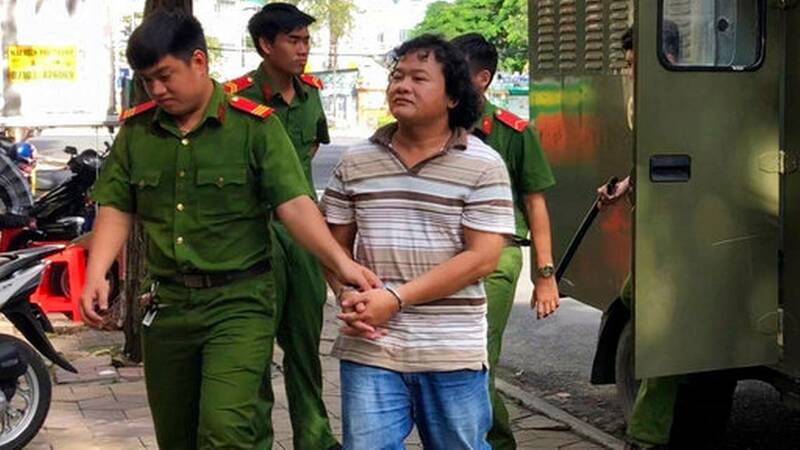 Also this week, we highlight the case of political activist Nguyen Viet Dung, founder of the Vietnam Republican Party, who was kidnapped and arrested on September 27, 2017. He is now serving six years in prison. In the news and analysis section, read one activist’s opinion about Vietnam’s first female president and commentary on the recent string of arrests of Facebook users. Finally, watch the preview clip from our new video interview series with female activists and former political prisoners! Stay tuned for the first full-length interview. It’s not too late to support the series; donate here! And please subscribe to the newsletter! On September 24, 2018, Doan Khanh Vinh Quang, 42, was sentenced to two years and three months in prison. According to his indictment, Quang, using a Facebook account name of Quang Doan, posted Facebook comments that were offensive to the Party and the authorities. Security forces said that they found two yellow flags with three red stripes in his house, which was the national flag of the Republic of Vietnam in the South before 1975. He was also accused of provoking other people to protest against two proposed bills on special economic zones and cyber security on June 10, 2018. Lastly, on September 27, 2018, the People’s court of Thot Not district, also in Can Tho province sentenced Bui Manh Dong, 40, to two years and six months in prison. According to the indictment, Mr. Dong was accused of creating many documents with distorted content during the period of 2017 to July of 2018, which were meant to defame the Party, state, and other leaders, such as Former President Ho Chi Minh or Former President Ton Duc Thang. Luu Van Vinh (above, left) will face trial next week on October 5. He has been held without trial for almost two years. Several others will be tried along with Vinh, including Nguyen Van Duc Do (above, right), Phan Van Trung, Nguyen Quoc Hoan, and Tu Cong Nghia. All face charges under Article 79 of the 1999 Criminal Code for subversion. Vinh and his friend Do had both protested Chinese activity in the South China Sea and the toxic Formosa spill that began in April 2016. Vinh founded a group called the Coalition for Self-Determination for the Vietnamese People, which he had left a few days before his arrest. The defendants’ lawyer has been able to meet with them, but only under the supervision of police. Beginning on September 1, police secretly began to detain the above people and withheld information about their detentions from their families. The group had planned to promote peaceful demonstrations in early September. Apart from Mr. Thao, the others are still detained at Ho Chi Minh city’s Police Department. Huynh Truong Ca’s was the only case that police publicized soon after the arrest. On September 26, 2018, Nguyen Thi Tuyet Lan, the mother of imprisoned blogger Nguyen Ngoc Nhu Quynh (Mother Mushroom), visited her at Detention Centre 5, Yen Dinh District, Thanh Hoa province and updated Quynh’s supporters that she has not recovered from her 16-day hunger strike, which ended on July 23. At the visit, Quynh was thin, with her hair was falling down and her complexion dull. On September 19, Quynh made a phone call to her mother and reported that her cellmate was still harassing her. However, in the meeting on September 26, she informed her mother that the female prisoner had gradually changed her behavior and was no longer harassing her as before. Imprisoned human rights advocate Tran Thi Nga has been facing death threats from a cellmate. Some activists fear for her safety, and are concerned because Nga’s family was denied a visit with her on September 29. Many believe the abusive cellmate is part of the prison’s tactics to get Nga to “confess” to her crimes. She is a leading voice for land and labor rights reform in Vietnam and was sentenced to nine years in prison in 2017. Political prisoner Nguyen Nam Phong’s wife, Mrs. Yen, said that Phong was beaten many times when he was held in Nguyen Kim detention center, Nghe An province. Police brought a picture of Ho Chi Minh to him and forced Phong to greet him, and then continued beating Phong. They also slandered Phong with terrible words and scolded him, saying, “You follow the exiled reactionaries!” In August, Mrs. Yen and their three children visited Phong in Ha Tinh provincial detention center. His health was in poor condition due to forced labor. Phong is serving a two-year prison sentence. He was the driver for Catholic priest Nguyen Dinh Thuc and activist Hoang Duc Binh when Binh was arrested on May 15, 2017 in Nghe An province. This week, we remember Nguyen Viet Dung, founder of the Republican Party in Vietnam. On September 27, 2017, he was kidnapped and arrested under Article 88 of the 1999 Criminal Code. He was later sentenced to seven years in prison, reduced to six on appeal. This week, a group of security officers, led by Mr. Khuong, vice captain of the Dong Da security force, surrounded activist Dung Truong’s house. This supervision was to ensure that the state funeral of Former President Tran Dai Quang would be held without interruption. In March 2018, Dung Truong was taken to the hospital after an attack from plainclothes agents left him bruised and missing two teeth. He was beaten after going to a local police station to try to get a friend released. It’s here: the preview of our interview series with female activists in Vietnam. Thanks for your support so far! With this series, we would like to share the voices of more female activists. Would you like to help? Donate here, and check out the preview clip with female activist and former political prisoner Pham Thanh Nghien.